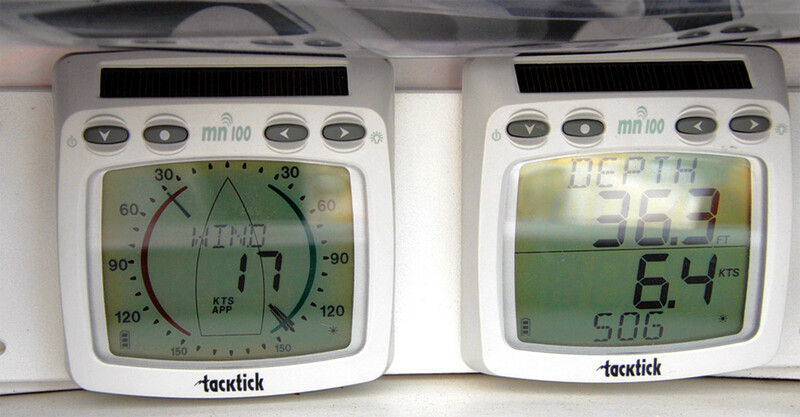 The British-made Tacktick line of wireless instruments arrived on the sailing scene in the early oughties with the Micro Compass, a standalone, solar-powered GPS and heading sensor, and soon expanded to encompass wind, speed and depth instruments. The main selling point of this Micronet instrument system was ease of installation—speed and depth transducer cables were connected to a hull transmitter, which communicated wirelessly with the solar-powered, battery-driven instrument displays. An optional NMEA interface allowed the instruments to link to other displays and chartplotters. Not even the masthead anemometer needed a power or data cable. I installed a set of these instruments on our Norlin 34 project boat in 2007, and they are still working much as they did 10 years ago. Installation was as easy as it gets—the hull transmitter can be located anywhere in the boat, avoiding the need to snake transducer cables all the way aft, and since the displays don’t need power or data cables you can put them wherever you want. I hard-wired the Standard Horizon chart plotter and VHF radio to the NMEA box, which sent the relevant data to the multifunctional, two-line T111 display. One thing that some users had trouble with was initializing the system, which required all the instruments—including the masthead wind sensor—to be placed next to the hull transmitter and then turning on one display. This “master” display then turns on the other instruments. The procedure has to be repeated each time you add a new display. I’ve found the instruments both easy to read and versatile, able to display a whole grab bag of info along with depth and speed—cross-track error, bearing to waypoint, VMG, heading, speed over ground, wind direction, lifts and headers. Despite being shaded by the dodger, the batteries in the displays have never failed, even after a succession of overcast days. The backlighting is kind of gloomy but at least it doesn’t affect your night vision. Yes, there have been some issues—sometimes the depth display is erratic, showing nonsense numbers or blanking out altogether for a few minutes. Replacing the hull transmitter made no difference to this, so I suspect the malfunction is within the display, but it has never been consistent enough to warrant replacement, and in any case the plotter at the helm shows depth. The wind transmitter’s anemometer stopped working two seasons ago—the bearings had seized up—and was replaced. I plan to replace the bearings in the defunct unit and keep it as a spare. Otherwise, I’ve had no problems. Raymarine purchased Tacktick back in 2011 and has not only kept the range alive but added to it. There’s a smart-looking line of racing instruments and the good old Micronet cruising system, now called the MN 100-2, is still available. There were many times this past fall, as I wrestled with upgrading the instruments in the current project boat, that I wished I’d gone wireless all over again.